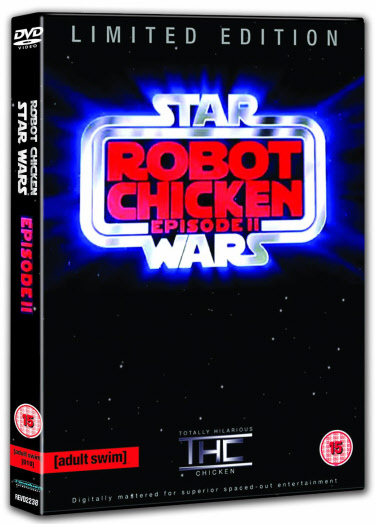 This is the second episode of the Robot Chicken take on Star Wars, I’ve already reviewed the first episode (read article) which I thought was good, so lets take a peek at the second. As the chicken strikes back to once again travel to a galaxy far, far away. The DVD is available now from HMV, or from the end of October you can buy both episodes together. On the DVD you have the regular broadcast version, but also a special extended edition which is 15 minutes longer, so even if you watched the broadcast version this is still worth getting. In this episode many of the same characters feature as in the first one, on their mission to capture Han Solo. The famous opening crawl text of Star Wars glides up somewhat modified, in text language, complete with LOLs, OMG and all sorts, there is no chance of reading it all as it moves up at speed and with text language even the biggest chav couldn’t understand! I won’t put in any spoilers in to this review (I know plenty of people hate that!) but this has to possibly be the funniest thing I’ve seen from [Adult Swim], the first ep was good but this one takes it further, with none stop laughs, and I mean proper laughs not just little smiles! All the characters are in, with some ridiculous plots and lines, your typical Seth Green production! Much like on the first DVD there are some cool extras as well. Including 2 bonus episodes, both very funny! I think I laughed almost as much at them as I did at the main episode, especially at the smurfs and notably the line “Chronic Masturbator Smurf was just found with his wang chopped off stuffed up his smurfhole!”. Other extras include; production design, video blogs, trailers and animation meetings. Once again a strong bit of work on [adult swim], if you’re into this style of comedy (or like your Star Wars parodies) I really do recommend you check it out as it doesn’t get enough exposure on our screens. You will have seen nothing like it before! I rate it 9/10.